New Ways to Wear Linen — Anna Akbari, Ph.D. Properly cared for linen is a timeless material that never goes out of style – it’s been around the block, from wrapping ancient Egyptian mummies to modern household use. However, it’s also a fresh fabric that should absolutely have a place in your summer wardrobe – the weave of linen and linen-blends wicks away moisture, making it perfect and refreshing on hot and humid days. Here are some innovative ways to wear the fabric. 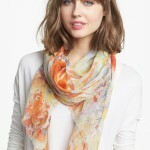 Iris Linen Scarf at Nordstrom Scarves aren’t just for winter and fall! A light fabric like linen is easy to wear year-round, and looks great casually draped about your shoulders or neck for summer evenings or in air conditioned offices. The abstracted floral pattern on this scarf is classically summery and comes in a variety of four softly-muted color families for easy mixing and matching. Keep it in your bag to quickly add a dressy touch to a plainer sundress in white or complementing colors. Rebecca Taylor Studded Linen Dress at Shopbop Often, people make the mistake of associating linen solely with flowy, carefree looks. This Rebecca Taylor dress combats that image with crisp tailoring, smart front pleats, and a neckline that softly dazzles with neutral, understated rhinestone studding. Your favorite little black dress might get jealous, because the combination of elegance and whimsy in this number is perfect for a rooftop party or other warm weather event. Linen Cutwork Moto Jacket at Free People Lightweight linen is the perfect fabric when dressing for an occasion that calls for a jacket in the middle of summer. The cutout pattern along the shoulders and back adds tasteful texture to the subdued neutral hue of this Free People jacket. The moto construction adds the perfect amount of structure to an otherwise carefree ensemble. Laundry by Shelli Segal Laser-cut Linen Dress Though a white linen blouse is a great basic, the fabric wears color and texture equally well. The intricate laser-cut design on this dress is intriguing, and as a bonus, will ease your fears about the fabric wrinkling easily. A flattering scoop neck and back keyhole add a retro, easy-to-wear flavor to the bold tropical color – perfectly paired with an equally bold sun hat. Calvin Klein Printed Linen Skirt Pencil skirts can feel constricting in the summer. Beat the humidity but keep the look with a linen skirt. 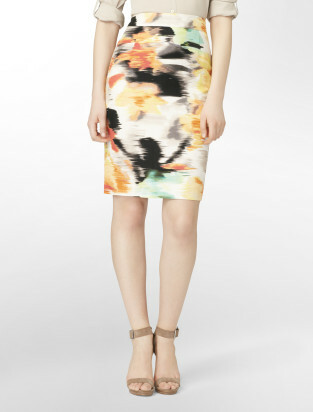 This Calvin Klein piece comes in an abstract print that looks smart and modern. It’s perfect for the office with a silky blouse, but you can dress it down with a solid top and wedges, too.